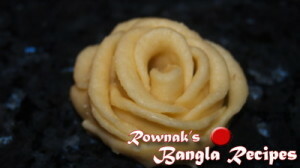 I want to rephrase the making style of Golap Pitha. 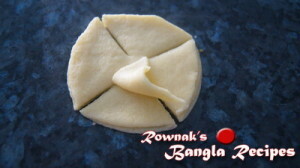 I love my other recipe Golap pitha too but I find this easier and less time consuming. Please don’t forget to join my facebook group or like my facebook page to keep in touch with me .Thanks. Make syrup with sugar, cardamom, cinnamon and 2 cups water. Keep aside the syrup because we need lukewarm syrup. 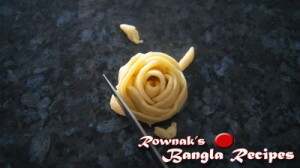 Boil milk/ water with salt and when it comes boiling point, add flour. Turn of the heat and let it sit for 2-3 minutes under closed lid. 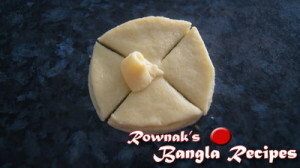 Make smooth dough with boiled flour and clarified butter. 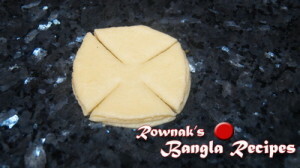 Divide the dough into 4 balls. 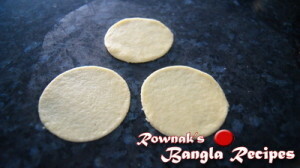 Roll each ball into thin flat bread and cut with cookie cutter. 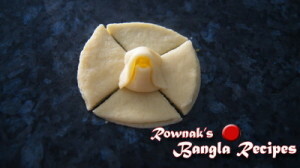 We need 3 to make 1 rose and check the picture to the step of it. 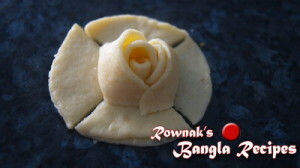 Need to bend or spread petals to give the look of exact flower. 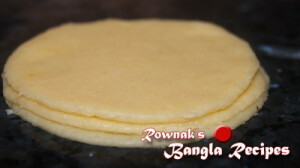 Heat the oil on medium heat and fry Golap pitha till it becomes golden brown. 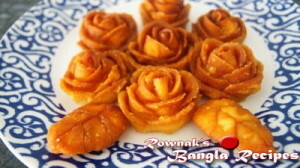 Take out fried Golap pitha from oil and soak in syrup for 2 minutes. Take it out from syrup. 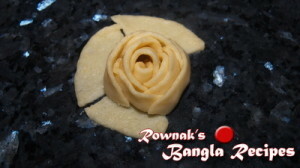 Serve beautiful Golap pitha (The food Of Bangladesh). I like your recipes very much. It will be nice to see them in You Tube.